So Mayday performed for close to 1 hour 50 minutes last night! My friends are still suffering from Mayday withdrawal symptoms. My brother was blown away by Mayday. Even my father was impressed. The set list consisted of many classic Mayday rock hits. It served as a comprehensive ‘Mayday introduction’ to people who watched Mayday’s live performance for the first time last night. 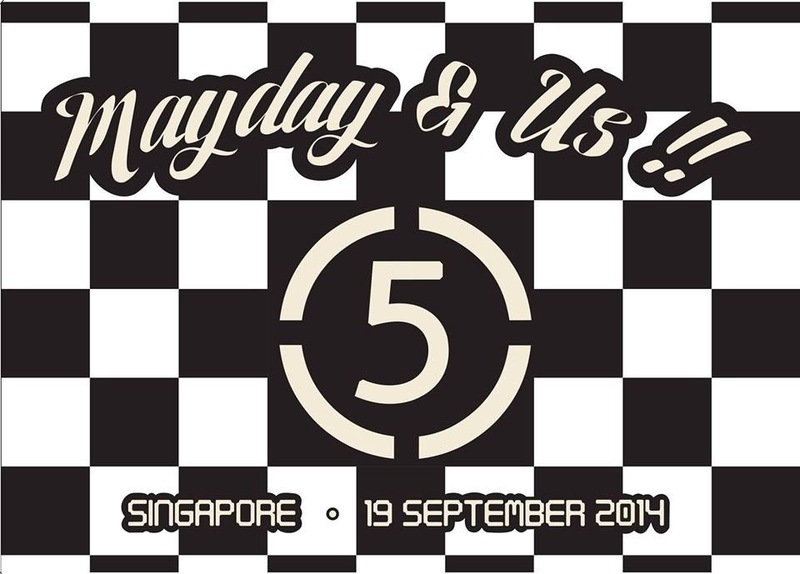 Mayday seized the opportunity to showcase their music to a mainly ‘international’ and ‘non-Mayday-fans’ crowd. I believe that some people were converted into Mayday fans after a close to 2 hours sensational live performance by the boys. 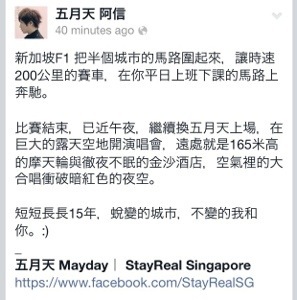 The ever poetic Ashin wrote a nice FB post about his thoughts about F1, Mayday and Singapore. Some pictures to soothe my ‘痛不如死’ wounds (courtesy of crazy friends)! More high quality pictures at Straits Times article and Xinmsn. I have been a terrible Mayday fan for the past few months. I have neglected Mayday. And my ‘痛不如死’ punishment has intensified in the last few days. 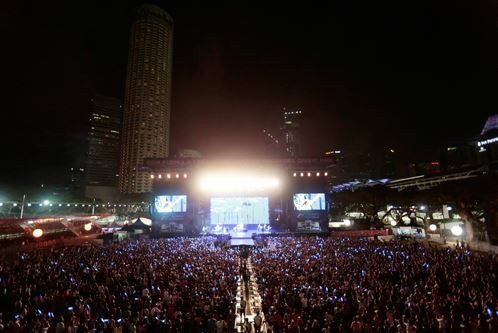 Everyone in Singapore is getting so excited about Mayday’s F1 performance. 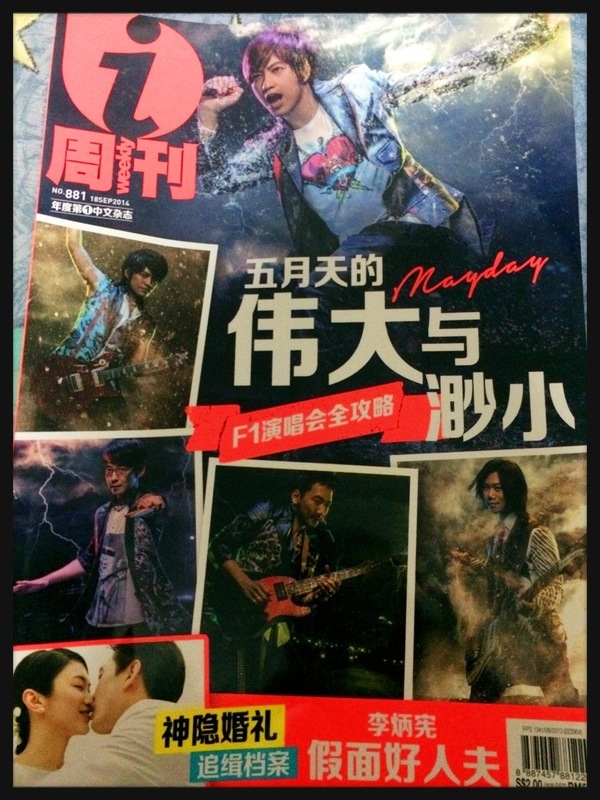 Just look at what 古菜包 (a super devoted Mayday fan) did! Incredible Mayday spirit in Singapore! I wish I am there to wave the flag and be part of the Mayday solidarity. Even my father is feeling excited. He just asked me, “他们的名字很奇怪! 怪兽? 石头?” And he even went around telling all his friends that Mayday will perform for 3 nights! 3 nights…?! I am regretting my decision not to return to Singapore this weekend. I actually bought some walkabout tickets. However, it was just too expensive to fly back. So I decided to pass the F1 tickets to my family and forced them to watch Mayday’s performance this Friday. I really want my father and brother to understand why I am so crazy about Mayday. Unfortunately, I can’t afford to bring them to the normal concerts as the tickets are too expensive. Hence, F1 offers the perfect opportunity for me to treat them to a mini Mayday showcase. 1) 轧车 – The boys will definitely will sing this classic ‘racing car’ song! Check out their first low-budget-super-orh-bit-MV! 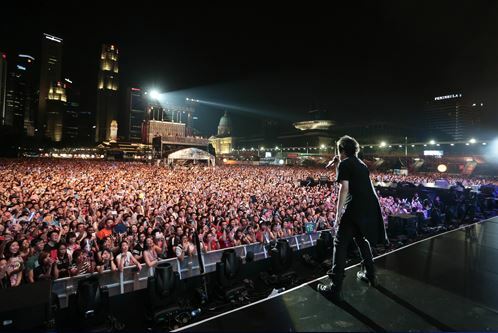 2) 人生海海 – An all-time favorite sing-along song for the big crowds. 3) 离开地球表面 – An energetic song to match the speed of the F1 racing cars. 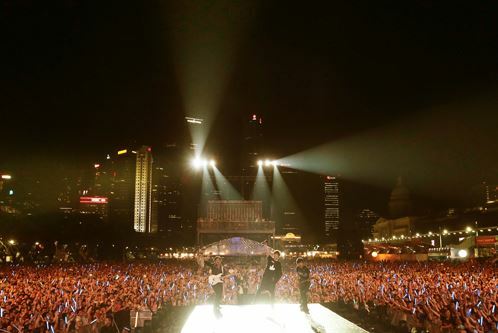 4) 伤心的人別听快歌 – Another upbeat song to get the crowds ‘dancing’! 5) 入阵曲 – A great song that can serve as a critical commentary of Singapore society. 6) 拥抱 – How about a ‘wave the rain bow flag’ song? 7) 倔強 – An uplifting song to accompany the starry starry friday night. 8) 溫柔 – Somehow I think it is quite unlikely that the boys will sing this. Hopefully they will sing this rock ballad so my brother can hear it live. 9) 步步 – Maybe a slow song to end the first day of the F1 races? 10) Do you ever shine? – Ah! Singapore may get lucky and hear this! I almost died with happiness when I heard this in Osaka summer sonic. Oh well, the boys may sing more than 10 songs. I heard rumors that they will start around 1130/1145 p.m. The performance should be about 1-1.5 hours long. Mr Jay performed for about 1 hour previously. The boys will probably end by 1 a.m latest as the last train leaves city hall at 1.30 a.m. Prepare your outdoor concert essentials (light sticks, raincoat, mat, wet tissues and etc.) for the ultimate Mayday F1 experience!